Dr. Thai has been my family's dentist for over 10 years. He is extremely knowledgeable, experienced and compassionate.The office is absolutely beautiful! You will feel like you booked a day at the spa, rather than visiting the dentist's office.Dr. Thai always takes time to make his patients feel comfortable and explains each procedure in detail. 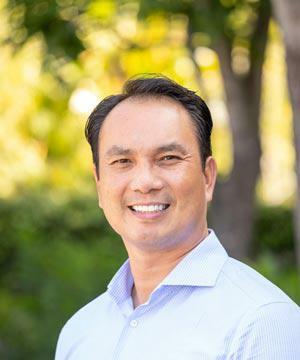 He is experienced and I always feel that I am in good hands, when in Dr. Thai's care.After having moved to San Francisco a few years ago, I still travel to see Dr. Thai for my cleanings and dental work. To me and my family, he is worth the trip! I have been going to Dr. Thai for about 4 years now. I had switched to Dr. Thai after seeing the same dentist for more than 15 years. This truly is a family office that is Family Friendly!The first thing you need to do is throw away any preconceived notions you have about the Dentist. Throw out the metal scrapers used to clean your teeth, The Pain of a filling or the hassles of a crown. With Dr. Thai welcome to the 21st century! I have had the following work done with Dr, Thai.One Filling | One Implant | One Crown | Multiple CleaningsEveryone single service I received I was completely satisfied!! The cleanings are done with water NO SCRAPING! I Used to have a numbing paste put on my gums before a cleaning because of the discomfort I would feel. I have NEVER had to have any numbing paste with Dr. Thai. Absolutely no pain and my teeth are as healthy as they have ever been. My implant is PERFECT and you would never know I had it. My Crown was done in 10 days from start to finish and works and looks perfect ALL with no pain or discomfort.His Office is immaculate and very modern. From the modern flat screen TV you watch while having work is being done to the fantastic office. You always see the same team (Dr. Thai, Ha and Marianne) so you build a relationship and become one of the family. One of the BEST dentists I've ever been. Very friendly and professional staff. Highly recommended. Easily the best dentist I've ever visited. He has cared for my entire family's teeth for the past 9 years. He's so good that we would travel all the way from San Francisco to visit him. Nice office, very friendly and open service. Dr. Thai is the best dentist I have seen and I have seen many dentists. He is very patient and friendly. There have been a few times when I was very scared and he took the time to calm me down in a very professional manner. He explains each procedure in details and answers patiently on all of my questions. No matter what he does, a filling or a tooth extraction it never hurts. I have always had complications after visiting any dentist until I found Dr. Thai. At the same time his rates are very reasonable. Getting an appointment within a week is easy. A few times I just walked in because I was in pain and he managed to fit me in his schedule.The office is always clean and there are lots of magazines in the waiting room.There is a huge parking lot just outside Dr. Thai's office so parking is not an issue.I have recommended Dr. Thai to many of my friends and all them have thanked me afterwards. Now that I've made a few visits here, I feel confident in writing my review. I had not been to a dentist in several years (don't make fun) so I turned to Yelp for my search. Dr Thai was one of the few dentists that turned up with really good ratings and his office was close to where I live so I hopped on over. I was able to find the office fairly easily and although it doesn't look like much from the outside, once you step inside you will be impressed with the modern decor. They keep current magazines on display (score!) and the staff is so friendly. They act like they've known you for awhile and make you feel welcome. All of the equipment is very up-to-date and the rooms are kept very clean. I had some other issues besides the normal cleaning that Dr. Thai helped me with and the services were very affordable. I also really appreciate that I'm not left feeling guilty after my visit for any wrongdoing on my part. It just makes it a little easier to want to come back to the dentist. I think I'll settle down with this dentist for awhile and hopefully I can get my husband to start coming here as well. Definitely recommend. Dr. Thai is a wonderful dentist! He is relatively young and graduated from a great dental school (University of the Pacific). My whole family goes to him now. The great thing about him is that he is bilingual and can relate to the older folks as well as his younger patients. His offices are beautiful and most importantly, CLEAN. He is very professional, eloquent, and helpful. Making appointments with him are easy. There is never a long wait for an appointment. He will try to fit you in and he does not rush through appointments like some dentists. By far the best dentist I have ever met. I started going here via a referral from a friend and now have my whole family going here. Dr. Thai and his staff are honest, personable, and extremely professional. I can typically get a routine appointment within a few days, and if I'm in pain? The same day!My 10 year old (who was totally phobic of dentists) and my 3 year old LOVE going to see Dr. Thai. He is very patient and in tune to their needs! I never feel the typical 'sales-ey' feeling from this office and they really work with you in regards to payment/treatment options!I can't say enough about this great dentist!Look at his website!